A listener of some of our podcasts, Victoria Spadaccini, joins our host Kristin Sunanta Walker to talk about everything BUT the kitchen sink. We covered what it's like to be an ENFP with ADHD (interesting combo). The strengths of both - the super powers! Victoria is going to join us as a cohost on future shows because she has the key elements that make for a great podcaster: curiosity, professionalism, hyper vigilance, wisdom, and fearlessness. 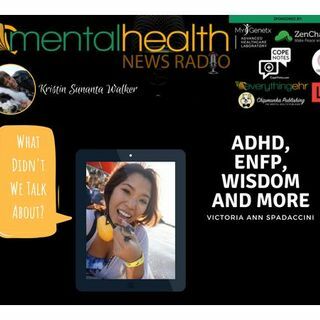 Victoria Ann Spadaccini is a passionate ... Más informaciones mental health advocate, writer/producer, public speaker, and ADHD Life Coach in the making. Her mission is to embody and teach what true, healthy love is and is committed to both living an extraordinary life and to helping you live an extraordinary life too. Send her an email (VictoriaSpadaccini@gmail.com), or follow her on Facebook (www.facebook.com/mangotsunami), Instagram (@Victoria__Euphoria), or Twitter (@brainmeetsbody).